Whether it is the budding blossoms, the longer days or the promise of less insulated clothing, spring brings an undeniable sense of hope. This uplifting feeling also flows into the real estate market – when the sun is out, the buyers are too. 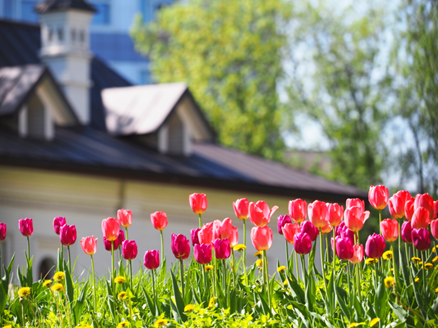 Here are seven reasons why selling a home this spring is a sensible move. Buyers Are Ready to Purchase. Temperatures aren’t the only thing heating up during spring. The housing market always gets busy between the months of March and June due to an influx of eager buyers. Since winter usually consists of harsher weather, early spring is when many buyers finally start looking for a home. Better Bidding Wars. Although spring brings out more sellers to compete with, it also means that there will be a plethora of homebuyers. The wave of potential homebuyers means more offers than any other time of the year. If your property is an attractive option, you can expect bids to go up as people fight to claim your house as their own. Homes Sell Faster and for More. Studies show that homes in California listed between mid-March and mid-April sold about 15% faster than homes listed during any other time of the year. People who sold their home during this time also saw an average national premium of about $4,000 since sales numbers are around 2% higher. Better Curb Appeal. As the sun begins to warm the dormant winter soil, trees blossom, tulip bulbs bloom and strategically placed flowerboxes shine. Spring unfurling sets a pretty stage for your home to look its best and draw the attention of potential buyers. Take advantage of the warmer weather to elevate the look of your home’s façade, front entry and landscaping. Everyone Wants to Get Settled Before Summer’s End. Homebuyers are anxious to get through the home buying process in spring, making them more inclined to buy before the season is over. This is because relocating and getting settled into their new home takes time, especially for families with kids. Buyers want to get into their home between late spring and early summer, so they are prepared for the upcoming school year. Longer Days. Our clocks spring forward in March and the days get longer, but in a good way. The simple fact that there are more hours of daylight means more time for potential buyers to view your home in a day. That boosts the number of eyes on your property and ups your odds of landing a desirable offer. Spring Lift. There is also something physiological that happens in the springtime. Even in areas where the temperatures remain steady throughout the year, people’s attitudes improve in the spring. Making big life decisions such as moving to a new city and selling their home somehow seems more palatable in the sunshine. Plus, homebuyers want to enjoy their new home in the best months of the year, so they are motivated to buy quickly and pay more. Adapted from an article on dreamcasa.org.